Voici une trace du passage d'un aviateur américain ayant servit dans l'unité Lafayette et ayant combattu avec succès dans le ciel de Sapigneul. The son of Edward Lufbery of Wallingford, Connecticut, Gervais Raoul Lufbery was born in France and moved to the United States with his parents when he was six years old. He enlisted in the U.S. Army for two years in 1907 and served in the Phillipines. After being discharged from the army, he traveled throughout Asia and, in 1910, took a job as a mechanic with Marc Pourpe, a French aviator. 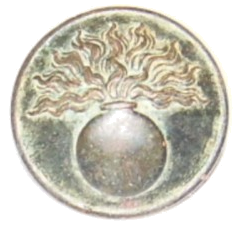 When the war began, they were in France and Pourpe quickly joined the French Air Service. Lufbery, being an American, joined the Foreign Legion but followed Pourpe to the front as his mechanic. 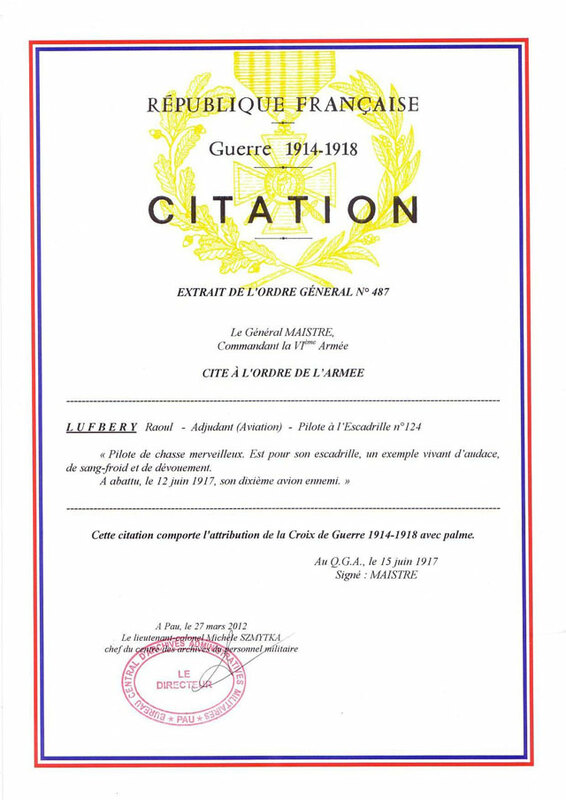 When Pourpe was killed in action in December 1914, Lufbery applied for and received a brevet in the French Air Service. After several months as a reconnaissance pilot, he moved on to single-seat fighters. 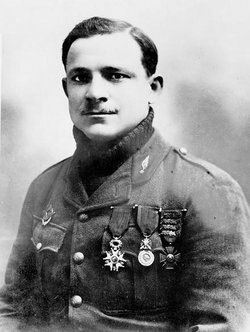 Lufbery spent almost four years in the French Air Service and with the Lafayette Escadrille, scoring 16 victories, before he joined the United States Air Service as an instructor in early 1918. Idolized by his subordinates and revered by his peers, he was killed in action as he attempted to bag a German Rumpler north of Nancy. Hit by enemy fire, his Nieuport 28 suddenly flipped over and Lufbery was seen to fall from the aircraft. The following day, in an impressive funeral that was witnessed by hundreds and recorded on film, Lufbery was buried in the cemetery at the Sebastopol Hospital. In the village of Maron, near the Moselle River, a bronze tablet marks the place where he fell. Lufbery's remains were later moved to Lafayette Memorial du Parc de Garches in Paris. In 2004, eighty six years after he was killed in action, Raoul Lufbery was posthumously awarded the Purple Heart.. The medal was awarded for wounds received in his final air combat on 19 May 1918. Nombreuses victoires dont la 10ème le 12 juin 1917 à 8h20 à "Sapignal" sur un 2 places. Il était alors pilote dans l'escadrille N124.